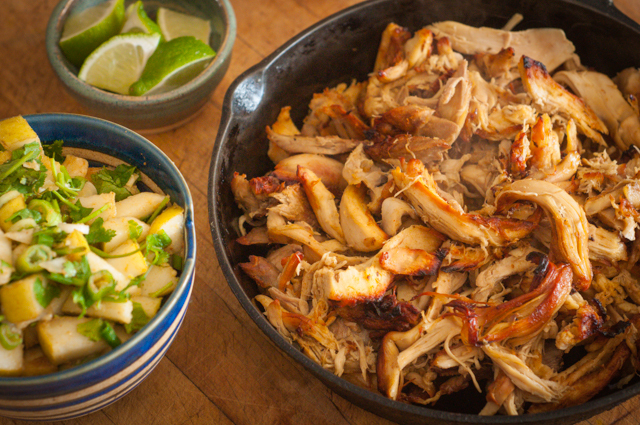 On something of a whim this winter (while we were at the cabin celebrating the Solstice), I whipped up a batch of chicken carnitas for dinner. I had had them a few times before and craved them constantly, and I knew that we'd all be down. Plus they were ridiculously easy to make – always a bonus in my book (especially on vacation). And? They were pretty much the best thing ever. We ate every bite, and have made them at least once a week since, with no one tiring of them (quite possibly a record for our crew). And considering the 90-some chickens we butchered this summer that are still filling most of a chest freezer in the barn, I don't see them dropping off our meal plan any time soon. The recipe that follows is flexible and forgiving. I normally make them the day-of in my Instant Pot, but if we'll be away all day I use the slow cooker. I've also partially made them ahead and frozen the meat and sauce separately after removing it from the bones. After thawing, I simply proceed with the recipe from the broiling step. Works like a snap! I've even jammed a frozen bird in both the IP and the slow cooker with equally delicious results. Before I dig in on the recipe, I would like to acknowledge that I am a midwestern Norwegian girl living in rural Wisconsin. This is not my family recipe or my tradition. With that in mind I would like to take a moment to thank to the brilliant culinary minds of Michoacán who first conceived of this delicious wonder. My family thanks, you, my tastebuds thank you, I thank you. Sincerely. Serve your carnitas on your favorite tortilla (corn, GF-wheat-like, or actual wheat) or in a bowl with rice, crisp romaine, and maybe a few corn chips. Or go paleo and serve on a bed of lettuce. Basically, you can't go wrong with this. Oh, and the pear salsa. The pear salsa! It's almost a requisite part of the meal. I made it up on a whim with what we had on hand at the cabin last December and we've stuck with it every since. Don't skip it. Hungry yet? Me, too. Let's get cooking. 1. Pour stock into Instant Pot or slow cooker. Place chicken on top of broth, then pour lime juice over the chicken. Top with spices and garlic. 2. Cook in your Instant Pot for 40 minutes, natural release. My IP is older and doesn't have different pressure settings, so if you have a fancy newfangled one, (afflink) you're on your own. Chicken parts will require less time than a whole bird. If using a slow cooker, set on low for approximately 8 hours. Your goal is a chicken that is fully cooked and tender. Err on the side of slightly overcooked. Our goal is ridiculously tender meat. 3. Remove chicken and set aside on a cookie sheet until cool enough to handle. Reserve liquid in the cooker until the next step. 4. When chicken is cool enough to comfortably handle, preheat your broiler to high. Remove bones and skin, reserving for stock-making. * I sometimes toss the skin back into the liquid in the pot for a minute to do some spice recovery, then remove, but it's not necessary. 5. 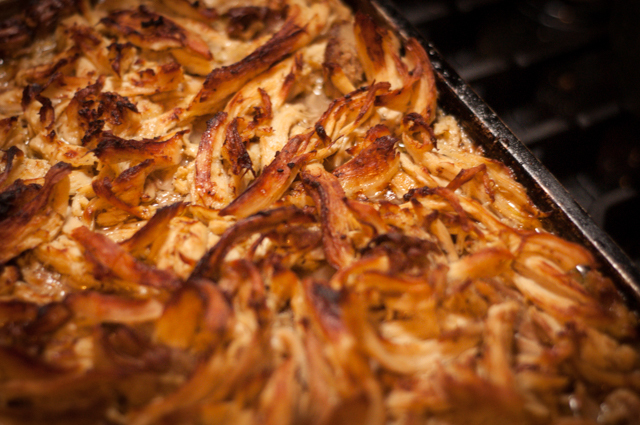 Using your hands or a couple of forks, shred chicken into bite-sized strips and return to the cookie sheet. Pour 2/3 of your cooking liquid over meat, approximately 1 cup, and stir or toss to combine. 6. Place under broiler with rack pretty close to the heat. Broil for 10 to 12 minutes, then remove, stir, and return to broiler for another 10 to 12 minutes. After 2 rounds the edges of the meat should be starting to get crispy and amazing. Depending on your broiler heat, you'll want to do this a total of 2 to 5 times until your meat looks something like the photo below, with a good mix of dark crispy bits and soft, tender pieces. 7. When chicken is crispy in parts but still juicy and tender it's ready to eat! Serve with tortillas or lettuce, pear salsa (below), limes, and other toppings listed above. Core and stem pear, then chop into bite-sized pieces. Combine with remaining ingredients and stir to combine. Taste, adjust seasoning, and eat. P.S. Need a printer-friendly version? Here you go! Looks/sounds amazing! I’m saving up for an IP but I’m really stumped on size. Can you fit a whole chicken in a 6 qt? Oh man this sounds great! This is going on next week’s menu! I think for the newer IP’s it would be manual pressure–>high pressure–>40 min.–>natural release. You can! And I do. That said, if I had it to do over again I’d definitely snag an 8. They didn’t offer them when I bought mine, but for making stock a larger pot would be wonderful. These were RIDICULOUS. I’m not a huge meat eater, it these were so, so good. Mmmmmm…the flavor and crispies….